Actually there was a problem with the trigger. PayPal has changed few codes and for that after the IPN confirmation subscription is not activated. Within tomorrow we will fix this. Mayer, you market the previous post as private. And I ask what about me? I have the same problem. We are working on this. As early as possible we will fix this issue. I have checked your site. Also I have checked with my own PayPal sandbox details. Subscription was working fine. Nayen, What site you check? and you mean you fixed the problem or what? I need this working – URGENT.. I think that's all I need..
Just like Kris and R&F, I need this issue to be fixed. I don't know what you tested in PayPal sandbox but the problem is Not Fixed. The subscription packs are Not Activated. We just ran a number of Live PayPal payment tests with real money transactions. It still does not work. Same problem as 2 weeks ago. I'll detail the exact test process here. Please keep this simple. You test it exactly as we tested it (as a New User). Please read everything here carefully in TEST, PROBLEMS, and YOUR FEEDBACK before you reply. 1. The New User can never use the subscription pack that he already purchased. 2. The New User is never auto-logged-in after Registration or after PayPal Purchase. So I don't know how your software can assign the purchased subscription pack to the correct User. 3. In WPUF>>Transaction, there is no transaction. In the New User account, there is no Assigned Pack. If there's something I'm not understanding or if I made a mistake in my test, let me know clearly. Your forum replies do not explain the problem you found, how you tested the problem, or how you solved the problem. Please give clear detailed feedback in your forum replies. As you can hear from other customers (Yves and R&F), it is very difficult to understand your forum replies. Your forum replies are confusing. Nayem, I'm trying to be as clear and helpful as possible. It has been 2 weeks now. My team is really trying to be patient here. But this is very frustrating. I have your site details and I have checked the recurring subscription pack with my own paypal sandbox account and that was working fine. 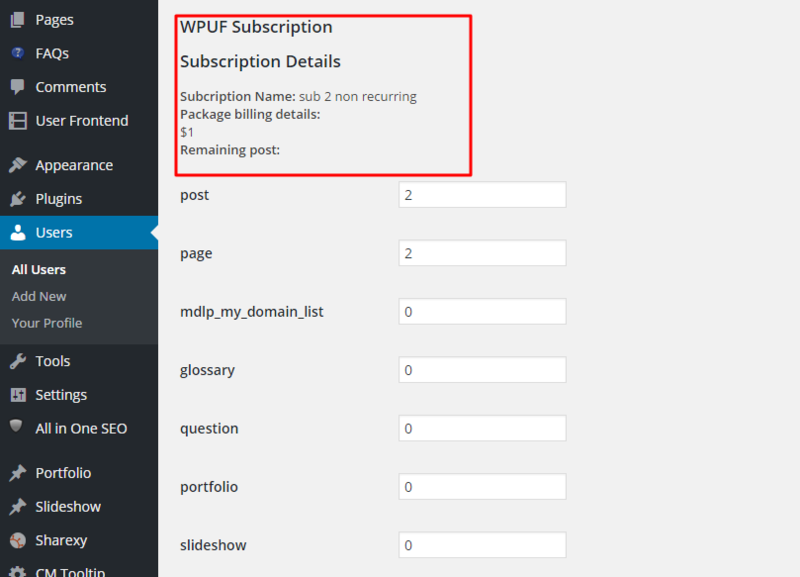 If you want then you can check the subscription list from WP User fronted Pro->Subscription. You will get the list of active package. Now, I will check it again for you and this time I will provide you some screenshot of the process. Please allow me some time. @r & F Tecnologic- Actually my reply was for Kris. I am relly sorry if I did not mention the name in my post. I have purchased a recurring pack with the user name wedevs. Please check the subscription list. 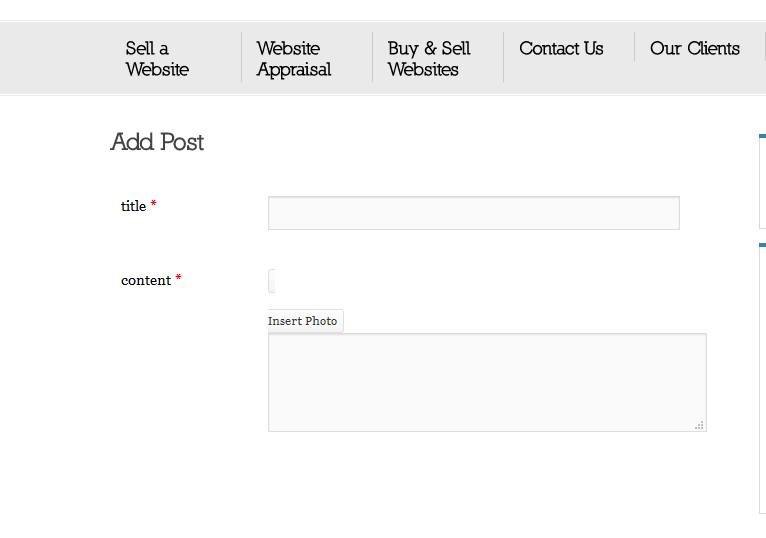 Here is the form I have used to post- http://www.premiumwebsitebrokers.com/add-post/. But I have tested with the sandbox mode. You can also check the user profile from backend. In the user (wedevs) profile you will see that subscription pack is already assigned. I will suggest you to check your PayPal credential. You have to make sure that there is not mistake to insert API password or user name. I had seen your test pack sub 1 recurring listed on my website at WPUF>>Subscription. And I see the wedevs User. Why are you testing with a Recurring Payment test pack? My subscription packs that you see listed on my website are not and will never have recurring payments. So your test doesn't really help. Once this problem is fixed, I will delete your test pack from my website. Test a Non-Recurring Payment pack as I tested and directed in my last forum post (above). Test it with a real Live PayPal Payment. 1. There may be an error with PayPal IPN pack activation process for Non-Recurring Payment Subscription Packs. 2. My test pack is $0.01. Your test pack is $1. Your software may not allow websites to have subscription packs of less than $1. 3. The test pack works in Sandbox mode. But it does not work in Live mode. Please look into this and let me know today. My team will be here waiting. Thank you. Update: I have double-checked my API information with PayPal. It is entered correctly and properly integrated. This problem about PayPal y real serious and frustrating. I just can't launch my site for this. Please Nayen. We need to fix that very quickly. As I say before. Without this the plugin just don't work. I know you can, as before. Thank you very much. Went all work as should be. I'll send my feedback. @kris I have also checked that. You can see the list there is a test subscription pack without recurring. I think there is a problem when you are inserting PayPal details. Please make sure that you have inserted PayPal details correctly. Can you please test with your own sandbox details? @r & Till now we did not get any issue in our plugin. We have tested in many ways by sandbox details. Though it is working with sandbox mode it will work in live mode too. Please make sure that you have inserted payapl details correctly. – Sandbox does not work for us. It has never ever worked. That's why we have had to test with Live PayPal payments. – I do not see any new Non-Recurring pack that you now tested. And I do not see any transaction for a Non-Recurring pack in WPUF>>Transaction. You created one recurring pack called sub 1 recurring that I mentioned before. This recurring pack is listed in Transactions as 4720. There is no transaction listed in WPUF>>Transaction for a non-recurring pack. Login as Admin and check it yourself. “$0.01 Test Subscription Pack” (which I created and I asked you to test for non-recurring) has no transactions. What is the name of the non-recurring pack that you tested with? What is the name of the User that you used to test this non-recurring pack? Also the subscription pack was assigned in the user profile- http://i.imgur.com/c97B8ci.png. The 2 transactions you see in the image are for sub 1 recurring Pack #4720. There is no transaction for sub 2 non-recurring Pack #4737 that you just tested. As I said before, Login as Admin and check it yourself after you perform tests.